Most of the Vietnamese food fans in my life fit squarely into two camps: pho devotees and bánh mì aficionados. 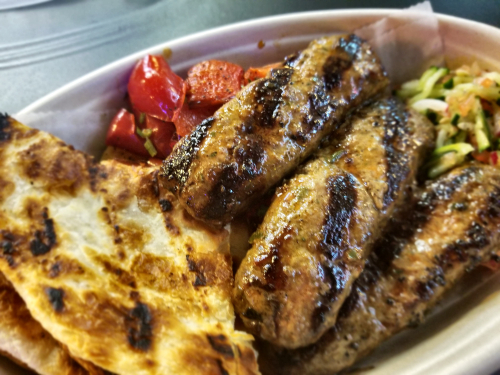 While I appreciate both in their finest forms, I typically look at another part of the menu when I'm lucky enough to be dining on Vietnamese fare -- I am transfixed by the búns. 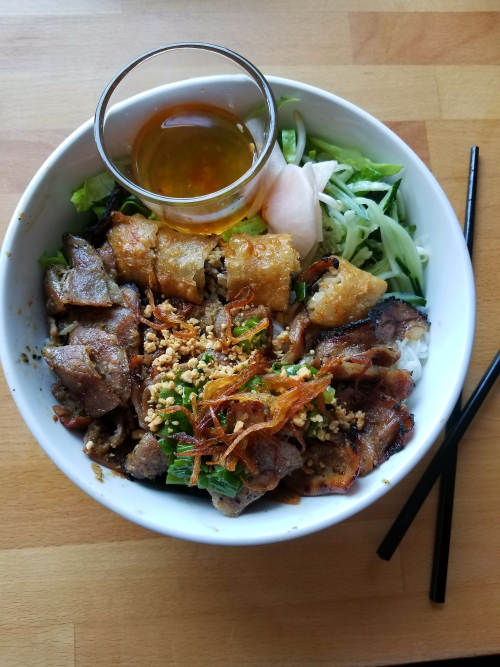 For those of you not familiar, a bún is a bowl stuffed with cool rice vermicelli, chopped lettuce, mint leaves, pickled carrots and daikon, sliced cucumbers, scallion, flash-fried shallots, and peanuts -- then topped with a variety of different lemongrass-scented, grilled meats and/or a crisp spring roll. Douse it with a vinaigrette spiked with fish sauce, lime juice, garlic, and hot chiles, toss it about, and grab a pair of chopsticks. Yum doesn't come close to describing it. 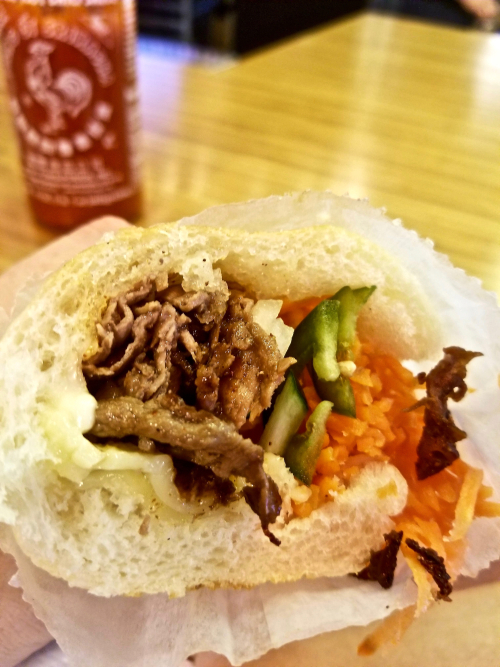 Have yet to find a New York City go-to when I need to get a fix, so I've been counting on trips to Philadelphia and San Francisco to get my bún on. The superb specimen pictured above is from one of fave spots in SF called Tin. Already dreaming of a January visit to Philly, and one in February to San Francisco. 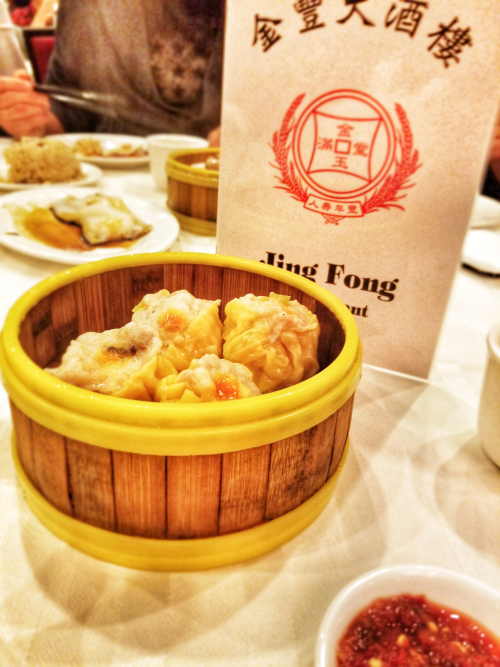 If rail and air miles are necessary to get me my bún bliss, so be it! 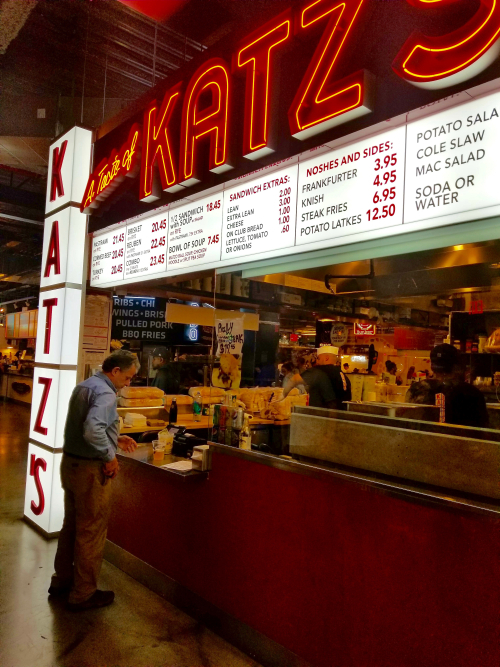 I had very low expectations when I headed into the new DeKalb Market Hall. It tries to offer something everybody. Artisanal donuts? Check! Italian heroes? Check! Shanghai street food? Check! Gourmet grilled cheese? Check! 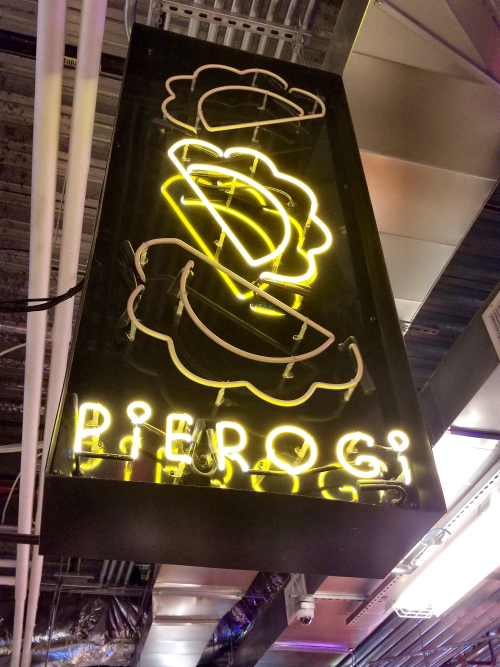 Polish pierogi? Check! Pit barbecue? Check! Lower East Side-pedigreed pickles? Check! And, since hipsters like shiny nostalgic things, the hall sports more than its fair share of faux-vintage neon signs. Dare I hold out hope? I brought my pal Brooklyn Fit Chick along for the grazing to make sure that more than one palate - and plate - was put to the test. To put it kindly, the sandwich was insipid. I don't know how it's possible to create a lackluster Bahn Mi with the inclusion of Vietnamese pickled vegetables and jalapeno peppers, but somehow it was done. We consoled ourselves with a pickle from Guss' and took several turns around the place to see if there was another stall worth a go. After much debate, we settled on two. 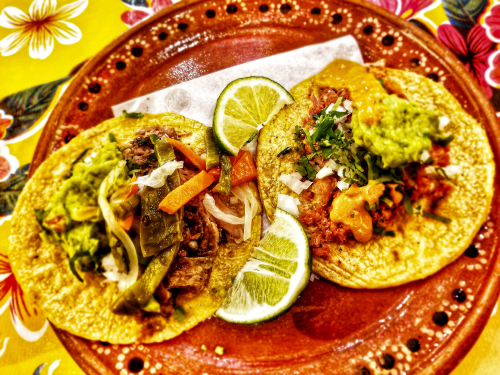 These delectable plates filled our tummies and restored our faith. I'll definitely be back for more. Change the "u" to an "e" in this post's title and I might be talking about the latest indie film starring Ben Stiller. Instead, I'm going to talk about a gaping hole in my life. That hole is better known as my stomach -- a stomach which has gotten used to reveling in carnivorous carne delights during my August stay in Buenos Aires. Instead of visiting Argentina this summer, I spent the last two weeks of the month in San Francisco, where Kombucha was celebrated on every street corner. My tastebuds and stomach did not like. 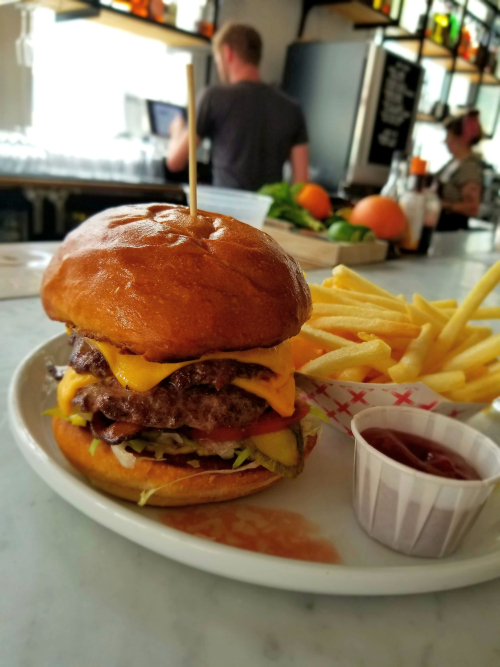 So, when a friend of a friend started waxing poetically about the city's many fine burgers, my ears perked up considerably. Thankfully, one stop -- Black Sands Brewery -- was literally right smack dab around the corner from the apartment where I was staying in Lower Haight. Their hamburger had been described to me as "a classed up In-N-Out." That description wasn't praise enough, as this was a specimen of beefy beauty. Pictured above, I'm sure you can see where the In-N-Out comparison isn't totally off-base, but one bite into this juicy double-patty, special sauce-laden lovely and you know that the ingredients are what bring this baby together. 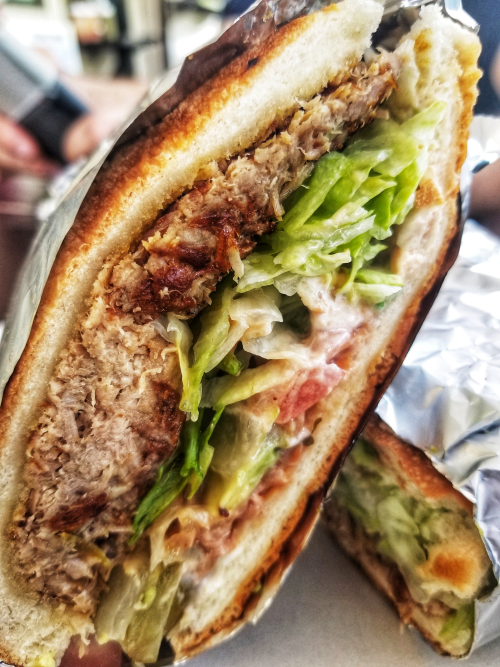 It's got gooey melted American cheese and shredded iceberg, which I recognize as a middling ingredients at best, but the quality of the meat in the smashed patties really shines through and the oozing and tang of the processed cheese and crunch of the cool lettuce just plain worked. This burger was "stellar" to say the least. Another nearby hamburger fix was had at a popular burger and barbeque joint called 4505 Burgers & BBQ. Meat they had aplenty. I almost succumbed to the day's special of whole smoked hog, but I was on a burger quest, so a cheeseburger was had. 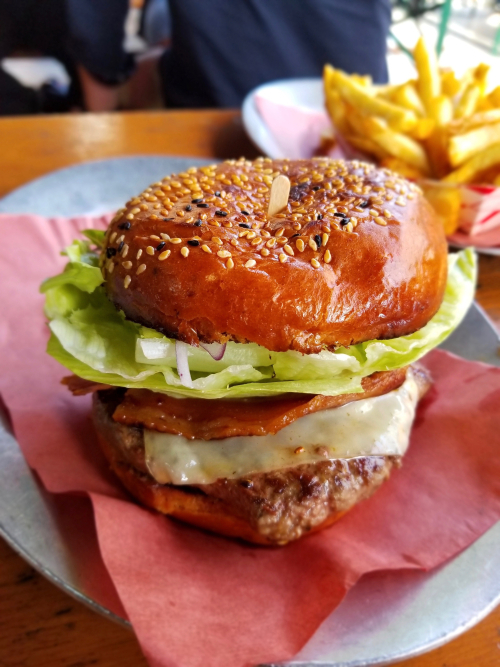 This was a one quarter pound grass fed beef patty with leaves of iceberg, thin slices of onion, Gruyere cheese, and a couple slices of bacon on a griddled bun. It was good. Very good in fact. It was potentially made better by the seating situation, dining on picnic benches near the kitchen while sipping an ice cold IPA. Still, I'm giving it a "very good." The last burger on my tour of the city, led me to the chainstore cluttered streets of the Marina on a day that topped 100 degrees. 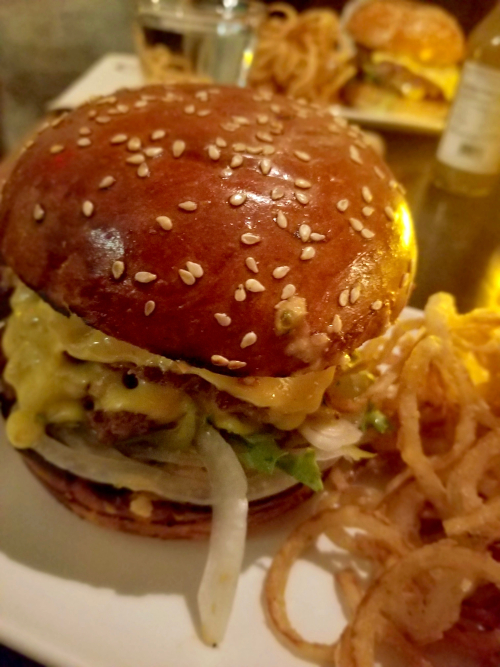 Despite the record-setting temperature, talk of Causwells' Americana Burger -- accompanied by a mound of frizzled onions -- was like a siren's call. The fact that the restaurant didn't have A/C (unsurprising for a city that rarely breaks 68 in August) didn't deter. And biting into its two meaty patties, grease dribbling down my chin, I was glad I'd braved the sweltering heat. That said, I do think it is the addition of the thin, crisp, fried onions, which I piled on top, that put this burger into "mighty fine" territory. Without them, I'm not sure the burger would have seemed so special. Humidity that you can cut with a knife. Temperatures hovering around 90 degrees fahrenheit. No air conditioning. A steaming hot bowl of soup. Doesn't sound like a combination that would illicit pleasure. But, pleasure was had. My "in-the-know" food-riffic friend Peter led the way. 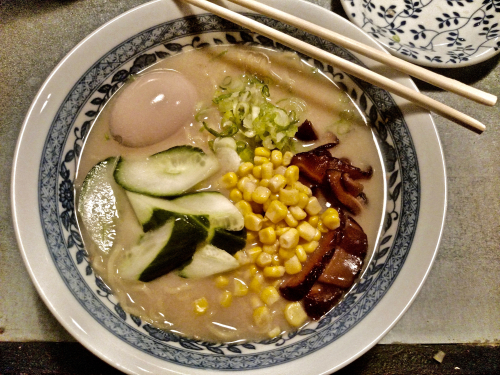 It was a hot sticky summer evening and the man had a bowl of ramen on the brain. 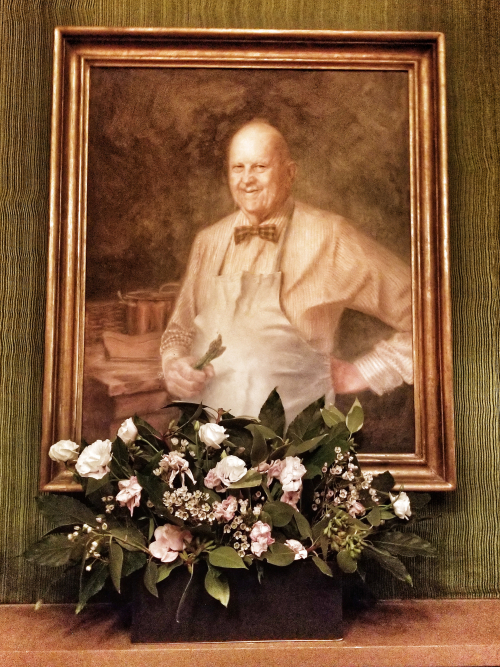 In specific, he couldn't stop raving about a new spot called Za-Ya Ramen at the far end of Court Street in the netherworld between Carroll Gardens, the Gowanus Expressway, and Red Hook. We had to go. The place is barebones, but clean within an inch of its life. No A/C, so heat from the day and the open kitchen permeated the room. Sweat aside, I soon felt transported by a small bowl of Zuke-don, ruby red raw tuna, served with sweet onions, scallions, and soy dressing on bed of warm rice. Delicate and rich all at once. Then we tucked into a plate of Chicken Karaage, perfectly crisp pieces of boneless fried chicken with spicy mayo for dipping. Then came the big bowls, mine brimming with a vegetable broth so intense that it was creamy and packed with umami. It was served with sweet corn, shiitake mushrooms, scallions, cucumber, lotus root chips, and a soft-boiled egg for good measure. And then there were the noodles, delectable noodles with a bit of give and chew. I wanted the slurping to go on forever. Do I wish that Za-Ya Ramen had air-conditioning? Yes. But, that won't stop me from slurping up more of their genius ramen before autumn arrives. It's so worth it. It's taken a while for me to write a proper post about my all-time favorite neighborhood Italian go-to. Why? 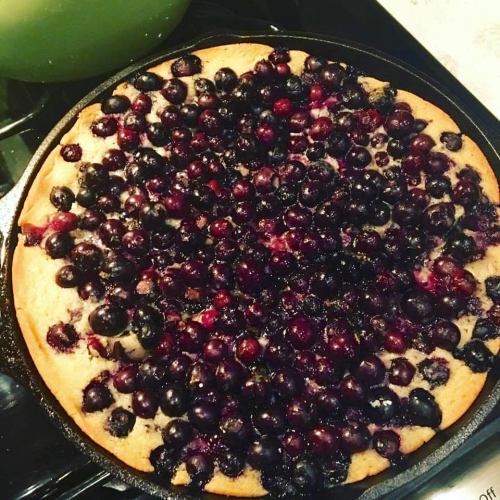 My excuse has always been that I can never get a good photo of the food at dinner. Just too dark. But really, I might just have wanted to keep the place to myself. Well, the latter has been shot to hell. 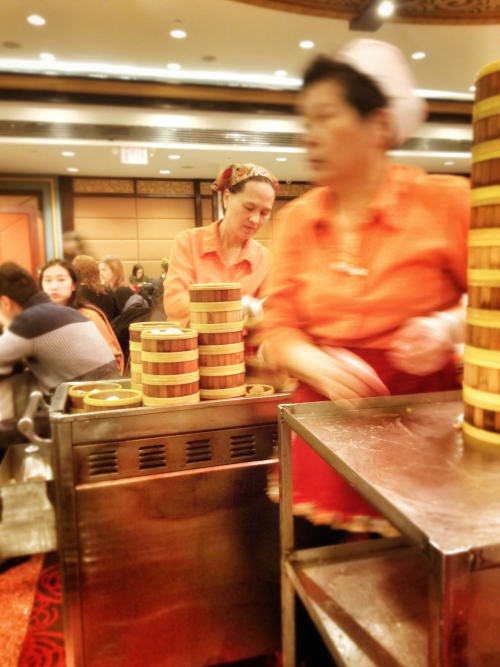 A lot of people are "in the know" about Brooklyn Heights' Noodle Pudding. That's right: Noodle Pudding. Horrible name for an Italian restaurant - a direct translation of owner Tony Migliaccio's last name. But, oh, what a fantastic neighborhood spot! So good that people line up to wait for a table, despite its cash-only policy and low-key vibe. Everything is fresh. Seriously fresh. Vinnie's Montauk Bass on the menu? It was likely brought into the restaurant by Vinnie that morning, still flapping its gils. The Tagliata, a dish of sliced "fresh meat" prime rib with rock salt and rosemary, accompanied by super crispy potatoes and thin green beans, is a carnivore's dream come true. And, the pastas? Just take a gander of the snapshot above. 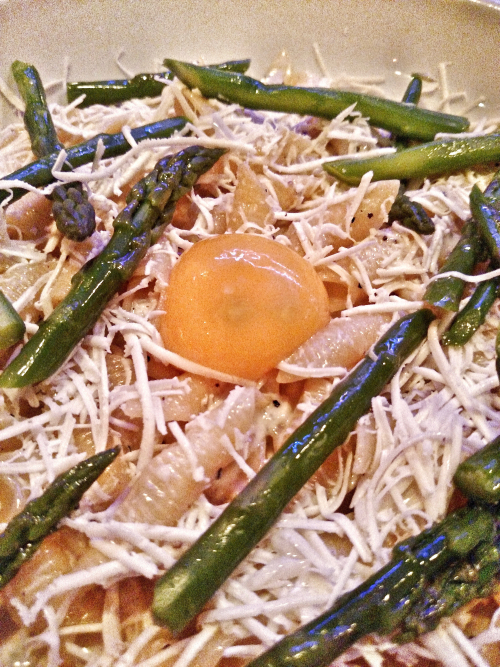 Homemade Garganelli, served Cacio e Pepe-style with farm-fresh asparagus and a bright yellow egg yolk. The risottos are equally gorgeous. Dessert isn't an afterthought either, with solid classics like Tiramisu at-the-ready. Still, I'm often content with a few slices of sweet watermelon from the kitchen. And, if nothing sweet from the kitchen appeals that evening, there is nothing wrong with an espresso and shot of Sambuca to finish off a classic Italian meal in the County of Kings. But, to be clear, I have yet to be disappointed by anything that comes out of Tony's kitchen. 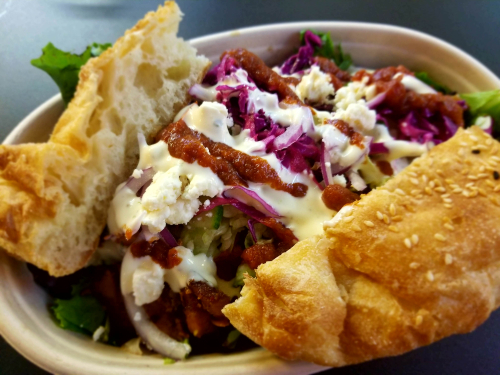 Noodle Pudding's menu is ever-changing based on what's best at the market that day - and that unwavering commitment to quality is evident on the plate. What doesn't change at Noodle Pudding, for the most part, is the staff. Tony keeps very good people. Great people. People I like to see behind the bar and table-side on a regular basis. There. I did it. I wrote a post about Noodle Pudding. Don't think it'll land me plaque-qualifying status, but as long as I still can get a seat once in a while, I'll be just fine.